This post on Roleplaying Pro reminded me of a gaming tool/accessory that I discovered at the local Wal-Mart the other day. I purchased it, brought it home, and promptly forgot about it until John's post reminded me. 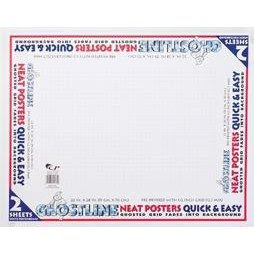 These posters are white but have a very lightly shaded 1/2 inch grid. The grid is easy to spot when you're close but much less noticable when at a distance, and the grid size is perfect for play with minis... each 2x2 section is a perfect one inch square. Regardless of how I use them, I'll post as soon as I get a chance and let everyone know whether they're worth the money. Considering how cheap they were... my guess is that they will have been a worthwhile investment.